Update (2010-02-25): This contest is now closed. To celebrate the completion of this book, I'm giving away three copies. O'Reilly Media increased the offer to five books! All you need to do is comment on this post by February 24th, and I'll pick five people to send a copy to as soon as it's released (Amazon says March 15th). If you prefer, I'd be happy to send you a copy of Regular Expressions Cookbook instead (please note which book you want in your comment). Four winners will be chosen at random from the pool of unique commenters (I'll be tracking IPs), and the fifth based on the reason given for why you want a copy. Make sure to include your email address in the comment form, since I'll need it to contact you if you're selected (your email address won't be used for any other purpose). Good luck, and congratulations to Nicholas Zakas and all the other authors on completing a fantastic new book! Edit (2010-02-05): My blog has been offline more often than not for the first two days after posting this, and many people have reported that they were unable to post a comment. I apologize for the screw-up—my blog is now on a different server, and the problems should be resolved. Please try again! Edit (2010-02-08): O'Reilly Media kindly offered to pick up the tab for this giveaway, and increased the winnings to five books! Edit (2010-02-25): This contest is now closed. Winners will be announced here shortly. The winners have been informed by email about how to collect their prize. Thanks to everyone for playing! More importantly, though, congrats on your success(es) and thanks for the contributions to our (collective) reference libraries. I wish I could give a copy to every engineer in our company. I’m trying to push the idea that we need Front End Engineering as a role. Just having a copy of this would be great! Congratulations. If I don’t win the book, I’ll probably get it anyway. I’d love a copy to share with my department. Performance has become a focus for us and you and Nicholas write well about the trade-offs various techniques require. The odds of winning are pretty slim, but I guess I can always buy it :-). Want it to make my life easier! Can’t wait to see this book :). I read your “Regular Expression Cookbook”, Crockford’s “JS The Good Parts” and read blog NCZOnline regurarly. When I doscovered you guys, it was the best turn-over in my JS learning process and I’m constantly becoming better JS programmer. 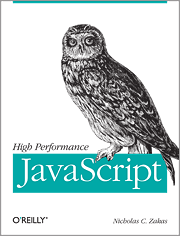 I believe it’s going to be a killer-book for JS developers. Would love to get it! I am keen on optimizing my scripts to prevent these consequences for my users’ health and, possibly (when things are really bad), hardware. Many people will benefit from it. Hope I’m not too late, I’d like to know how to make my js code faster. This contest is now closed. Good luck to all participants. Winners will be announced here and contacted in early March. Gotta get that JS Book, surely it’s a must-have, just as your Cookbook is. I’m buying the PDF the moment it comes out. Here’s my entry for the dead tree version too. I am very excited about the book release in India. Ncz ur way of writing is rocking..
“Dead tree version”, that is great! is there an on-line version? I’m the following to see good quality comments! Err, this site won’t load properly on my Ipad.